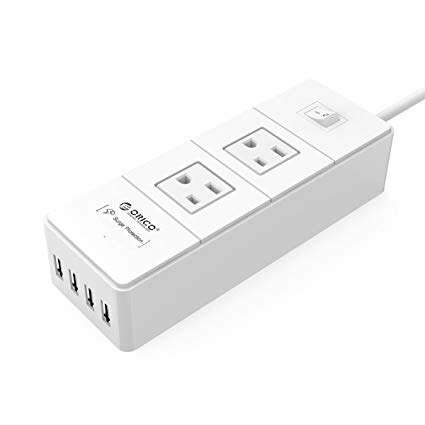 ORICO IPC-2A4U 2 Outlet Power Strip with Surge Protector, 4 USB Intelligence Charging Ports (5V 2.4A) - White - NWCA Inc. Turn one outlet into two with the surge protector. The 2 outlets surge-protector offers ultimate convenience and protection for computer electronics, home entertainment systems, and more. 15000A max and 1700J surge-suppression rating, the unit transfers optimal power and helps keep plugged-in devices safe, especially during storms and power outages. Built-in power switch, whose life is up to 6000 times, turns on / off as you need. ORICO's multi protection safety system ensures complete protection from electrical short circuit, over heat, electric surge, over charging, over current and etc. Its beautiful chassis made of PC & ABS plastic material makes it fireproof of up to 750?. Ultra powerful 4 ports USB charger up to 20W, is able to charge 4 tablets or smartphones. Integrated with fast charging technology that enables each port to detect and deliver ideal input current each time of up to 2.4A. Due to synchronous rectification technology, its electric energy conversion rate reaches up to 85%, which causes less unnecessary heat and is more environment-friendly. USB ports power down in case of shortcircuit happening avoid accidents. Integrated sheet copper design, high conductance and great heat dissipation, pull and plug 6000 times not loose. The safety guard protects children from an electric shock and prevent dust. There is natural anti-slip rubber footpads at the bottom, so that it is steady and hard to move for desktop use. Soft white LED indicator doesn't disturb your sleep. Protection System - Surge / Over Current / Over Voltage / Short Circuit Protection, etc.